What is Gapers Block? 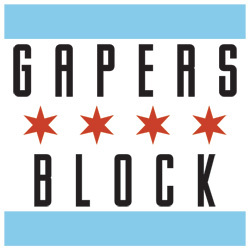 Gapers Block is a Chicago-centric web publication providing information on news, events and other interesting stuff around town. Gapers Block wants you to slow down and check out your city! Consider GB an antidote to all those sites infatuated with the coasts. On the front page, you'll find Merge, a weblog on a wide range of topics updated throughout the day; Slowdown, a calendar highlighting events you may not have heard about; a daily photo in Rearview and a question to ponder and discuss in Fuel. The site also includes topical sections covering arts and culture (A/C), literature (Book Club), food (Drive-Thru), music (Transmission), politics (Mechanics) and sports (Tailgate). We also publish a weekly email newsletter, I ✶ Chi. Our volunteer staff of contributors is made up of Chicagoans both native and imported, with diverse backgrounds and interests but two things in common: a deep love of the city and a wish to share it with you. If you're interested in joining us, see our submissions page. OK, but what's a "gapers block"? There are many terms for the slowdown in traffic that occurs when there's an accident on the side of the road. Some people call it rubbernecking, others a lookie-loo. Here in Chicago (and a few other places where Chicago expats are common) we call it a gapers block or gapers delay. What better name for a site that asks you to slow down and check out all the cool things in the city? Andrew thinks Chicagoland is the best amusement park ever. A lifelong night owl, he works deep into the night at his West Ridge two-flat, writing and editing and playing with the cats. He spends more time online than probably is healthy; follow along at me3dia.com. Email him at ah@gapersblock.com. Mike moved to Chicago from Wisconsin to teach nonprofits the secrets of the Internet. When he's not chasing down stories, blogging or tweeting he likes to seek out good tunes and good brews in the Wicker Park area. You can reach him at mike@gapersblock.com. A graduate student in sociology at the University of Chicago and the Visiting Assistant Professor of Social Sciences at the Illinois Institute of Technology, David is involved in more projects than he can shake a stick at. You can check out some of his diversions at his personal website, metroblossom, and that flickr place. He has South Side pride. Email him at dcs@gapersblock.com. Nancy is a Chicago native, recently liberated after 30+ years in corporate marketing and PR. She is happy to be writing for Gapers Block about things she loves, especially theater, film, books, music, art and design. You can read her personal writing at nancybishopsjournal.com and follow her on Twitter @nsbishop and email her at nancy@gapersblock.com. Sarah is a native Chicagoan who graduated from DePaul University in 2012 with a degree in Communication and Media Studies. Raised on The Beatles and learning the violin at age nine, Sarah's passion for music began early on in life. Her musical obsessions include Wilco, Andrew Bird, Otis Redding, and The Tallest Man on Earth, to name a few. Feel free to follow her on Twitter. Email her at sarah@gapersblock.com. Robyn is from Omaha, home of the best pizza in Chicago. She laments the discontinuation of such foodstuffs as PB Max and OK Cola, and continues to fight for sweet treat justice (using elite street justice). 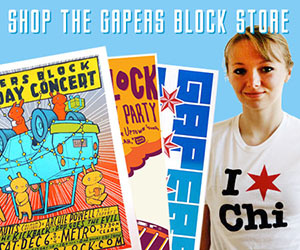 Email her at rn@gapersblock.com. Chad is a native Illinoisan who narrowly escaped the farmland in the northwest corner of the state to make it into The Windy City. He fell in love with the Chicago sports teams because they shared the same Ch- as his name does. He now regrets this and wishes his parents named him Boris since Boston has recently won a title in every sport. You can email him at cr@gapersblock.com. The following people help make the site pretty and build tools that help the sausage get made. A former spelling bee champ (Von Steuben Grade School, Peoria, IL), Jim wants you to know that "crepuscular" and "vespertine" are synonyms. He also has a Website. Vince currently lives in Avondale and works in graphic design. He squeezes watching movies, listening to music and playing with gadgets into every wedge of free time not spent enjoying the company of family and friends. Naz cofounded Gapers Block in 2003; he now lives in San Francisco. His design work may be found at weightshift.com.